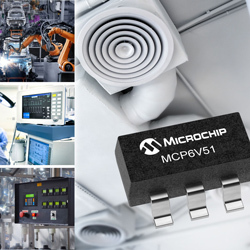 Microchip has released the MCP6V51 zero-drift operational amplifier. The new device gives ultra-high precision measurement while reducing the growing influence of high-frequency interference. The device offers a broad operating range and on-chip EMI filters. The increase of industrial control and factory automation has led to a growth in the number of sensors that must be monitored, and the amplifier is intended to offer accurate, stable data from a mixture of sensors. The self-correcting zero-drift architecture of the amplifier allows ultra-high DC precision, giving a maximum offset of ±15µV and only ±36nV/C of maximum offset drift. Perfect for applications such as process control, factory automation and building automation, the device also supports a remarkably broad operating voltage range, from 4.5V to 45V. With the increase of wireless sensors and capabilities, high-frequency interference within sensitive analogue measurement is becoming a crucial consideration. The extra on-chip EMI filtering within the amplifier affords protection from these unwanted and unpredictable interference sources. This enables designers to offer enhanced performance while more easily managing an increasingly difficult environment.